The latest version of Linx has been released. You can install the new version (v5.14) concurrently with your current release (v5.13 or previous). To do so, see our guide below. Solutions that are created or upgraded to the new Designer can no longer be opened in previous versions of the Designer or Server. Make a backup copy of your solution file (.lsoz). 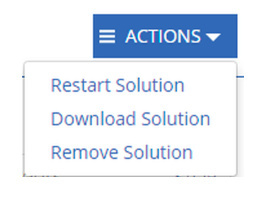 The new release will make changes to the solution file that cannot be undone. You will be warned about this in the popup. The solution will automatically be upgraded to be used in the new Linx Designer. Review your solution including port numbers (See: Server Port Changes below). 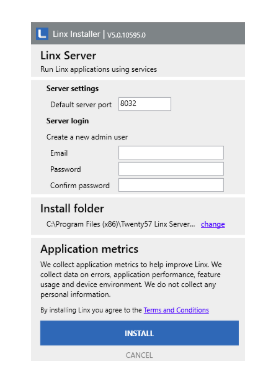 If you are calling a Linx process through web services, change to the new port number. When using the latest version of the Designer, you can only deploy to the new Server. 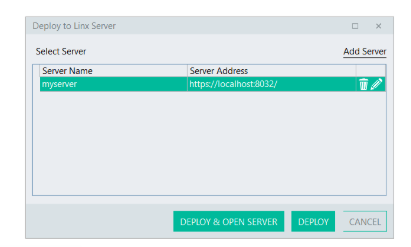 To upgrade and install the new Server, click Deploy within the Designer or visit https://linx.software/server-trial/. Like the Designer, the new Server can be installed side by side with a previous version. To do so, you must allocate a different port number (e.g. 8032). The default port for previous versions is 8022.
a) Click Deploy from the Designer. b) Add your new Linx Server (https://localhost:yournewport). c) The solution should start automatically. d) Start the services in the solution. Log into your previous version of the Linx Server. Stop all the services of your solution, or alternatively remove the solution completely. Contact us if you have any additional questions or require any further help to migrate your solutions.